The Singing Bowl: a poem and a new book! I am happy to say that this month I signed a contract wth Canterbury Press, who publish my current volume of sonnets, Sounding the Seasons, to publish a new volume of poetry at the end of this year, to be called The Singing Bowl. This will be a more wide-ranging collection thatn Sounding the Seasons, which was restricted specifically to sonnets following the liturgical year. In The Singing Bowl I spread my wings a little and offer poetry in many forms on a wide variety of subjects gathered from my writing over many years. It will include love poetry, nature poetry, and poems responding to contemporary life and culture, as well as more explicitly devotional and Christian poems. There will still be a link with Sounding the Seasons, as the new book will also contain ‘The Household of Faith’, a sequence of sonnets on the saints and other Christian figures who have been part of the cloud of witness for so many of us, including St. Augustine of Canterbury, Hildegarde of Bingen, Julian of Norwich, Samuel Taylor Coleridge and CS Lewis. Over the course of the next few months I will be posting some sample poems from the new collection to this blog and I thought i would start today with the title poem. 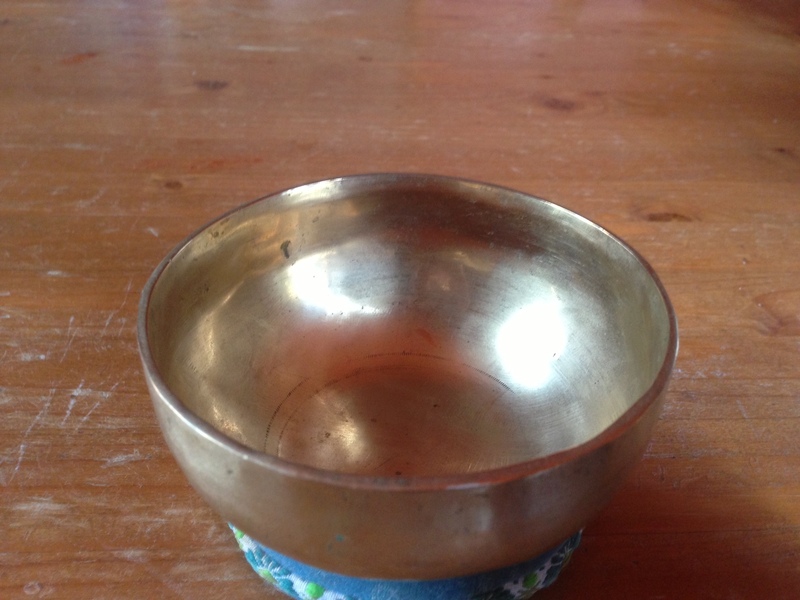 This poem was inspired by the beautiful Tibetan singing bowl in the photo above which trembles into sound, lovely sustained and resonant, as you run a ‘beater’ or even a finger, round its rim. The poem came to me as a word from the muse which was both about how to pray and how to fulfil my vocation as a poet. I hope you find it helpful and resonant too. As always you can hear me read the poem by clicking on the title or the ‘play’ button. I have also recorded this poem with the Jazz-poetry collective ‘riprap’ with whom I sometimes work, so I have included a youtube clip of one of our live performances after the text of the poem. Congratulations, Malcolm! This is a very beautiful and poignant poem. I love its singing silence and understand it completely. Thank you. Wonderful Malcolm.Congratulations. I used the image of a chime of a bell in one of my recent musings, I didn’t really understand the imagery since there are not much chiming of bells in this area but I knew what I meant and whala you posted the singing bowl- my imagery has found its home.Blessings. Beautiful! This poem is a prayer is a poem. I’m going to read it to my small group on prayer next week. Thank you. Just what I needed in this moment. Thank you. So rich and beautiful. Thank you! This takes my breath away. I shall also use it in my contemplative prayer group. Very excited about your new book! Hi Malcolm – I heard your lovely poem on R4 only a few moments ago. Your words resonate very deeply with me, and encapsulate my present process of re-finding my inner tranquillity and creativity – things which I felt I had lost sight of. Thank you. So very beautiful… quenches a deep thirst in this dry and parch time we’re in. Thank you! I would love to hear it in song form! Dear Malcolm. I love your poem, “Singing Bowl,” and wonder if I may have your permission to print it on the back cover of my ordination bulletin. Thank you for the gift of this wonderful poem and permission to use it next Sunday at my ordination. I so appreciate your prompt reply! I will list the credit just as you have provided. Congratulations on the forthcoming ordination!